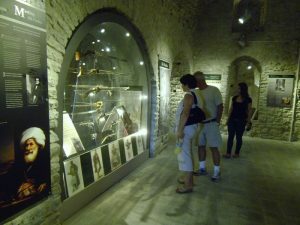 Gjirokastra Museum was opened in 2012 and housed in one of the most beautiful galleries of the Castle. It relates the history and culture traditions of the city and its surroundings area from the prehistoric times until nowadays, through archeological and historical objects, archive materials and oral histories. It is considered one of the most modern museums in the country with a special design and combination of the narratives and images. Ask at the ticket point for orientation and admission fees.